I’ve collected these stories from the DMV and the state of California on unnecessary or extravagant spending because, as a state employee who has worked in many different departments, I feel compelled to let people know this is happening. I love this country and want to help it stay strong. An Egyptian immigrant and former DMV employee has released her unflinchingly humorous exposé on the crippling government waste that plagues the state of California as well as the rest of the nation. In “The DMV… Asleep at the Wheel: An Immigrant’s View of Scandalous Government Waste,” author Mariam “The Mighty” Noujaim fearlessly tackles issues of government accountability and transparency from her unique perspective as an immigrant, drawing on how she went from a culture of shortage and conservation to one of abundance and waste when she moved to the U.S., and calls for readers to challenge the status quo, engage in political discourse and care about how their tax dollars are spent. Comparing her time spent growing up in Egypt where her mother recycled matches with her introduction to American culture, Noujaim’s book presents a collection of humorous vignettes about squandered government resources and draws on the relatability of DMV practices to encourage others to engage actively on public spending issues. 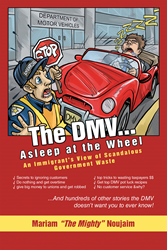 A positive book about an immigrant going the extra mile to make a difference, “The DMV… Asleep at the Wheel” represents Noujaim’s commitment to America and the hard work and fresh perspective many other immigrants can and do contribute to the country. “This book was very funny, but true at the same time,” a reader wrote in a five-star Amazon review of the book. Mariam “The Mighty” Noujaim immigrated from Ismailia, Egypt, to the U.S. in 1979 and was a California DMV employee for 25 years. Noujaim holds a bachelor’s degree in political science and mass communication from the American University in Cairo and has previously worked in the tourism, restaurant and real estate industries. She currently resides in Placerville, Calif. To learn more, please visit http://www.dmvasleep.net.